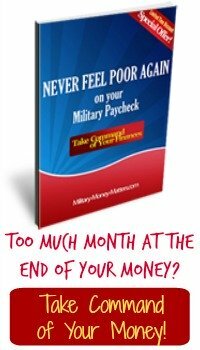 Welcome to our Military Families Blog, where we'll keep you up-to-date with new information posted on www.Military-Money-Matters.com, as well as other items of interest to military families. You'll find subscription information just to the right. What is Sarah Palin's Experience? We recommend that you read writer Kyle-Anne Shiver's article appearing today at AmericanThinker.com. The Heroes at Home Wish Registry(sm), sponsored by Sears, has extended its deadline to Friday, October 31. All active military personnel are encouraged to apply. Through this program Sears, in cooperation with the Department of Defense, enables Americans to fulfill wishes for up to 20,000 deserving military families and personnel this holiday season. This continues Sears' long-standing tradition of supporting the military, whose sacrifices deserve more recognition. Barack Obama attacked abortion survivor Gianna Jessen when she spoke out against his opposition to the Born Alive Infant Protection Act. "I've dealt with worse; I survived an abortion," Jessen says in a powerful new ad for BornAliveTruth.org. JESSEN: "Seen this ad? In it, Senator Obama personally attacks me. I've dealt with worse -- I survived an abortion. State Senator Barack Obama voted 4 times against laws to protect babies who survive abortions. Meanwhile, U.S. Senators voted 98-0 for Born Alive Infant Protections. Senator Obama says deciding when babies get human rights is above his pay grade. Tell him abortion survivors deserve legal protections too." Jessen became the first abortion survivor to appear in an issue advocacy advertisement earlier this year. After her first ad was released, the Obama campaign issued a response ad that said BornAliveTruth was misleading voters. This is the attack Jessen refers to in the spot. "Senator Obama had the audacity to go after Gianna Jessen, born alive after a failed abortion, and call her and the ad she appeared in 'a despicable lie,'" said Jill Stanek, executive director of BornAliveTruth.org. "We want to make sure voters are aware of Barack Obama's extreme stance on abortion, and that he voted four times, while an Illinois State Senator, to deny medical care to infants born alive after abortions." What can we say? Is this the type of man you want to lead this great nation? One who calls an abortion survivor a liar for publicizing his record of voting against medical care for infants like her, who survive abortion attempts? We pray that enough American voters see through the smoke and mirrors being put forth by the Obama campaign, to see that this man with no leadership experience has radical ideas about changing America in ways that would destroy the way of life we know and love. We know we're preaching to the choir, because if you don't agree with us, you stopped reading this blog long ago. So we ask you to please keep trying to reach your friends who have become Obama zombies. There's still hope! Barack Obama recently told "Joe the Plumber" the importance of "spreading the wealth around." And if you watch his rhetoric, you will see that "spreading the wealth" and "economic justice" are cornerstones of his political philosophy. A recording of a 2001 interview has him lamenting that the Civil Rights movement of the 1960's failed to bring about a redistribution of wealth in this country. And remember Michelle Obama's speech where she said that some would have to give up a piece of pie so that others could have more? Forty-one years ago today, Republican Presidential hopeful John McCain endured a day that has shaped every day of his life since. For every American voter about to select a President to lead our country through these troubled times, we suggest that character matters more than any other trait. This piece, written by fellow POWs who shared the darkest period of his life, and thus know him best, is a testament to the character of John McCain. "Country First" is not just a campaign slogan for John McCain -- it is the way he has lived his life. Much has been reported recently about the long list of Barack Obama's questionable relationships, and how they affect his qualifications to be President of the United States. They also reflect his judgment and tell us a lot about who he is. It is true that like attracts like. We tend to gravitate towards other people who share our beliefs and values. We all know that from our own lives. That's especially troubling in the case of Democratic Presidential nominee Barack Obama. Who is Khalid Al-Mansour, and what is his connection with Barack Obama? You should know. Obama made campaign appearances with Odinga and raised nearly a million dollars for Odinga's bid to be president of Kenya. Why do you care? Barack Obama's extended family paints a colorful picture, and it's one he'd probably prefer you not see. Attempting to research his family, including all his father's wives and mistresses, and all his half-siblings, is enough to confuse any voter. Obama shares a father with seven half-siblings, and a mother with one. That's quite an extended family. Writer Ray Kraft provides a thought-provoking historical perspective on the War Against Islamic Extremists. As you read this article, think about how America (and you) would react to being taken over by Islamic extremists, possibly as early as 2009 or 2010, especially if Iran is allowed to develop its nuclear capabilities. And don't be foolish enough to dismiss that idea as outside the realm of possibility, because it isn't. It is time for the good people of America to speak up and for the Silent Majority to remain silent no more. Turning points in history are often dicey things. Now, we find ourselves at another one of those key moments in history. Megan writes: I am truly in awe of all you men and women who are so courageous, honorable and dedicated. Your efforts are very much appreciated. Or even to play in his band! Obama critics have long been pointing to Barack Obama's long-time relationships with radical people and groups. But they're not doing so effectively. On July 31, 2008, the Wall Street Journal had an article titled, "Where's the Outrage?" Really! I can tell you where the outrage is. The outrage is here, in this middle-aged, well-educated,upper-middle class woman. The outrage is here, but I have norepresentation, no voice. The outrage is here, but no one is listening, for who am I? The Audacity of Obama -- to portray himself as a messiah who can heal the racial divide in America. In an article at Townhall.com, Phyllis Schlafly mentions the hope many Americans felt when Barack Obama won the nomination of the Democratic Party, that perhaps his historic selection would signal at least the beginning of the end of racism in America. Last week, Congress passed an unprecedented financial bailout bill. We've heard lots of discussion about the current financial crisis in the US over the airwaves in the past few weeks, and it has become a major issue in the Presidential election, now less than a month away. Perhaps that was the intent? Was this crisis manipulated in order to swing the election? Here's some information about the underlying source of the subprime mortgage mess. The Democrats are touting Obama and the economy, and claiming the massive mortgage meltdown and economic crisis is the result of eight years of "failed Bush economic policy." They say you should elect a Democrat President next month because, of course, the Republicans caused this economic mess, and, they say, McCain is part of the problem. Do you know an outstanding military spouse who deserves to be recognized for her support of our military? The deadline is fast approaching to submit nominations for the 2009 Military Spouse of the Year award from Military Spouse magazine. The award is sponsored by USAA. As the Oct. 8 deadline approaches, 252 Army spouses had been nominated at last count, along with 74 Navy and 70 Air Force spouses. The Coast Guard, with 22 nominations, was edging out the Marine Corps by one, with 21 Marine Corps spouses nominated. Guys! C'mon! You can't let the Army kick your tail like that. Get those nominations in! I am a Democrat, but I am confused. What are we going to vote for...Prom queen? Who the heck is Biden? What has Obama accomplished in the senate? For several months now, we've lamented the fact that we wish we had the opportunity to vote for Ronald Reagan again. It seems that with all the problems this country is facing, we need as much as ever his brand of strong leadership, statesmanship, common sense, and Peace Through Strength. Well, along comes Michael Reagan, Ronnie's eldest son, and tells us he recognizes his father in one of the candidates this fall. And it's not John McCain . . .
Brigadier General Jimmy L. Cash, USAF (Retired), was at one time the man with his finger on the nuclear trigger of this country, as head of our missile defense and response complex. According to Major General John R. (Jack) Farrington, USAF (Retired), General Cash "was the only person who could initiate a nuclear attack after advising the sitting President of a missile launch by our enemies and our need to respond. No political or civilian type in the US had more knowledge about day to day military actions around the world." Here, General Cash explains the critical importance of completing our mission in Iraq. It should be noted that he is neither Democrat nor Republican. I hope that you will read it with an open mind, and seriously consider what he says. The future of this great country depends on enough voters understanding what General Cash is saying, before the election in November!